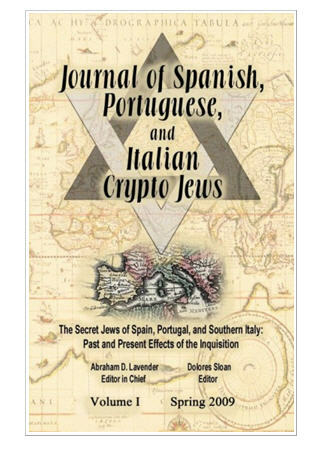 “The Journal of Spanish, Portuguese and Italian Crypto Jews” (JOSPIC-J) offers 10 truly fascinating articles in Volume I (Spring 2009). Available online, in addition to the abstracts, is the entire first article and an article on three major DNA studies. To learn more about the journal, click here. Read the entire first article – “The Secret Jews of Spain, Portugal, and Italy and Their Descendants Today: Major Issues in a Growing Field of Academic Research” – here, with an extensive bibliography. Read “Recent Research Articles: From Roth to DNA,” which discusses three recent articles about the growing field of Sephardic and Crypto Jewish DNA. For many people, the consequences of the Inquisition still live today, as we will see these consequences in this and future issues of JOSPIC-J. Sociology, history, religion, and other areas of study join together to analyze and explain these consequences. Crypto Jews lived in Spain, Portugal, and Italy, and today their descendants live in a large number of countries, providing a fascinating international flavor to this area of study. The journal is published by the School of International and Public Affairs, within the College of Arts and Sciences, at Florida International University in Miami, Florida. If Sephardic or Crypto Jewish studies is an interest, you will want to subscribe to this journal. The Journal of Spanish, Portuguese, and Italian Crypto Jews (JOSPIC-J) brings together in one place, for the first time in a refereed academic journal, research on the three countries whose historic Jewish communities, each predating the Inquisition for centuries, suffered directly and greatly from Inquisitions. There is no consensus on whether to use the term marranos, conversos, crypto Jews, secret Jews, hidden Jews, lost Jews, New Christians, or anusim. But, whatever the term, significant research continues in international, sociological, cultural, religious, political, historical, and other areas, and the number of books and articles is increasing. Research on crypto Jews and their descendants should be integrated more with other interdisciplinary research, a major goal of this journal. Prior to the riots of 1391, Spain’s Jewish community was the largest in Europe. By 1491, following expulsions and conversions, Spain had the largest single community of former Jews in the post-biblical history of Judaism. Depending on the definition of Jewishness applied, these conversos were arrayed along a continuous spectrum ranging from fully Jewish to fully Christian. This article analyzes four groups on this spectrum—Christians, Jews, seekers of truth, and skeptical dropouts. Brief attention is also given to Portugal which originally had less violence and less forced conversions than Spain, but which also developed a more tenacious crypto-Judaism which led to the establishment of an Inquisition in 1539. For the past quarter century, the author has immersed himself in Inquisition trial testimony in the archives of Spain and Mexico. The historical documents are difficult to read, but are worth extensive research, revealing fascinating and inspiring lives of unfortunate conversos. The following, based on these historical documents but with the addition of fictional narration, describes the lives of one representative family, Beatriz Álvarez and her daughter of the same name, known in 1630s Madrid as Las Barajas. It is an excerpt from a forthcoming book with the working title The Lost Minyan. Rabbi Barbara Aiello is the first woman rabbi and first non-orthodox rabbi in Italy, where she has served a progressive synagogue in Milan. She is currently rabbi of Ner Tamid del Sud, the first active synagogue in Calabria in 500 years. Rabbi Aiello has written extensively about her crypto-Jewish background and her efforts to uncover the hidden Jewish traditions of Calabrian Jews that date back to Inquisition times. Her work in the deep south of Italy and Sicily includes directing the Italian Jewish Cultural Center of Calabria (IjCCC), an organization dedicated to the anusim of southern Italy to help them discover and embrace their Jewish roots. Crypto Judaism in New Mexico is a highly complex phenomenon, both respecting history and modern ethnography. This paper outlines many of the significant aspects of both of these areas. It presents the historical arguments relating to the movement of conversos and descendents of conversos into New Mexico, and the aspects of the settlement of the colony that may have shaped aspects of crypto-Jewish culture as manifested in New Mexico today. The paper also touches on some of the ethnographic research relating to modern crypto Judaism, examining the forms of identity and the cultural elements out of which those fluid identities are formed. Given the significance of arguments about authenticity in relation to this community, the paper examines Neulander’s arguments in light of both empirical and ethnographic data. It suggests that when tested on that basis Neulander’s work cannot be seen as academically credible. The uniting theme of the paper is the need to eschew simple explanation in the light of a historically and ethnographically complex community. The Latin American and Iberian Institute of the University of New Mexico has initiated a research project to document the history of crypto-Jewish settlement on the Spanish Caribbean islands of the Greater Antilles, comprising Cuba, Dominican Republic, Puerto Rico, and pre-British Jamaica. Based on archival research in Europe and the Americas, as well as ethnographic analysis, this study will examine the role played by the descendants of Iberian conversos in the economic, religious and cultural life of an area of Spanish America that was situated on the major trans-Atlantic shipping lanes, yet administratively remote from centers of Inquisitorial persecution. The data derived from these investigations will be of great value not only in helping to understand the socio-cultural fabric of a vital part of the Caribbean, but also in bringing to light the activities of the earliest Jewish communities in the Americas. The following article is on the Jewish and crypto-Jewish participation in the age of discovery, from the fifteenth through seventeenth centuries. Though relatively small in number compared to their Catholic and Protestant counterparts, the Jews and Crypto Jews played a pivotal role in Europe, Africa, Asia, and the Americas as financiers, scientists, and explorers. Not only did they contribute to the prosperity of the empires that they lived under (even when the respective monarch did not show the same kindness to those of Jewish extraction), but also to the perpetuation of crypto-Jewish and Sephardic Jewish life and culture wherever they ventured. A systematic reappraisal of fifteenth century Jewish and Christian convivencia, or coexistence, is long overdue because within it resides a hidden history of cooperation among Old Christians, conversos, and Jews. Utilizing a historiographical lens to evaluate interfaith relations in several Castilian and Aragonese communities, one finds a broader range of communal outcomes than is traditionally acknowledged. New findings pertaining to the cohesive collaboration and intertwined relations of Jews, conversos, and Old Christians in the Extremaduran city of Plasencia refute the long-held assumption that Jews and Christians were routinely segregated from one another and corrects the misguided belief that the converso Santa María family persecuted former co-religionists. This study reveals the previously unknown strategic partnership of the converso Santa María and Old Christian Carvajal family in Plasencia and it’s role in maintaining medieval norms of interreligious cooperation. Due to his knowledge of Judaism and his influence among Judaizers in Mexico City, Juan Pacheco de León (Salomón Machorro) was a prize catch among conversos arrested in 1642 for crypto-Jewish heresy. Yet his name is less well known than those of more famous crypto Jews in Latin America, including Luis de Carvajal the Younger, Tomás Treviño de Sobremonte, and Francisco Maldonado de Silva. This essay rescues Juan de León from such relative anonymity by exploring the interrelated questions of why the Inquisition prosecuted him so painstakingly, what his case teaches us about crypto Judaism in colonial Mexico and the ordeal its practitioners suffered at the hands of the Inquisition, and why he did not achieve fame more proportional to the gravity of his trial. In order to answer these questions, it examines how León differed from other Inquisitorial victims due to his biography, knowledge of Judaism, and personality. Cecil Roth’s 1932 book A History of the Marranos popularized the term “marrano,” and increased knowledge about the secret Jews of Portugal and Spain, and also discussed secret Jews in Europe and the Americas. But, the secret Jews of southern Italy were mostly neglected. Roth corrected this omission in 1946 in The History of the Jews of Italy, discussing the secret Jews in Sicily, the Kingdom of Naples, and Sardinia. Cecil Roth and his wife, Irene, who was also his constant research companion for forty-two years, expressed strong emotional attractions for Italy and had planned to retire there before their plans were disrupted by World War II and the Holocaust. Many historical research resources have been used to study crypto Jews. But, especially since the 1990s, DNA research also has been able to add more information to crypto-Judaic studies. DNA research frequently cannot provide definitive answers about a specific individual’s possible secret Jewish ancestry, but it can provide insightful information about history. There are many articles on Sephardic DNA, but this brief report describes three recent reach projects about crypto-Jewish DNA, including the research project from Iberia which documents that about 20% of all Hispanic males (mostly Christian today) whose ancestors came from Spain or Portugal have a Jewish genetic ancestry. Learn more about the journal and subscriptions. Single issues are $10 (+$4 p&h), while annual subscriptions for individuals are only $10 (+$4 p&h). International subscriptions are $6 for postage and handling. “That was our name when we left Spain” was a Talalay family refrain. No one believed it, as I’ve often written. We were Yiddish-speaking Ashkenazim from Mogilev, Belarus – how could we be Sephardim? When I began researching Mogilev, I found quite a few families with Sephardic surnames and heard from others who had a Sephardic oral history, after writing about it on the JewishGen discussion groups years ago. Eventually, documents and index mentions for our Talalay (spelled Talalaya in documents) were discovered in archives in Spain, most in Catalunya. And I continued to write about the discoveries, possibilities and related issues in articles for the Jerusalem Post, The Forward and, of course, here at Tracing the Tribe. My good friend Judy Simon, who has a similar story in her Lithuanian family, and I joined forces in 2007 to find others and this year we co-presented a program at the Philadelphia conference on our IberianAshkenazi project at FamilyTreeDNA.com. Suzanne Kurtz, a freelance writer, attended the session at the Philly 2009 conference, interviewed me, Judy, Harold Rhode and Bennett Greenspan. Read her JTA story here. Despite leaving behind a Yiddish-speaking home in Latvia when he came to America in 1909, Sam Gold always told his children and grandchildren that they were Sephardic Jews. Many decades later his granddaughter Judy Simon, 60, would finally confirm her grandfather was not meshuganah. In 2004, after genetic testing became widely available for genealogists, Simon took a cheek swab from a male cousin and had his Y chromosome DNA tested. DNA geneticists explain that Y-DNA (male DNA) is passed on unchanged from father to son back through time. Matt Kaplan of the University of Arizona Human Origins Genotyping Laboratory can look at a Y chromosome and trace paternal lines back to Africa, some 100,000 years ago, although that isn’t exactly useful for genealogy. However, Y-DNA markers can prove a common male ancestor and approximate a time frame for that ancestor. The results for Simon’s cousin came back matching many Ashkenazi males from villages near their grandfather’s region in Rezekne, Latvia — but also matching two males from Texas and Mexico. With Spanish surnames and a known converso ancestry, the two men were equally surprised to find they matched with Ashkenazim. Conversos were Iberian Jews, from Spain or Portugal, forced to convert to Catholicism during the Inquisition of the 14th to 16th centuries. Many fled Iberia for the New World, eventually settling in what is now Mexico and the southwestern region of the United States. “The DNA results confirmed what my grandfather had been saying all those years: We were Ashkenazi Jews with Sephardic roots,” says Simon, a social worker from Stony Brook, N.Y. Most likely, she says, her ancestors fled Spain in the 15th century for the Ottoman Empire before making their way to Latvia in the late 18th century. In March 2007, Judy and I launched our project. The criteria for joining our IberianAshkenaz project are an oral Sephardic history, Iberian surname, Sephardic family traditions or carrying a Mediterranean genetic disease. The goal was to demonstrate the Y-DNA haplogroups and haplotype signatures of Ashkenazic males with Iberian surnames or an oral Sephardic history, and compare them with known Sephardic Jews and converso descendants. Today, there are 140 members (although I’ve been traveling for a few days and we may have more participants now!). Judy, who is the science part of our team, reports that many have confirmed matches with Sephardim or conversos. Amazingly, some 39% have Most Recent Common Ancestor (MCRA) matches who likely lived in Iberia from the 1300s-1500s, with another 47% whose MRCA was more distant, before the 14th century. In 1391, following massive pogroms across Spain, many Jewish communities were decimated, many were murdered, many others converted and a percentage decided it was simply time to leave Iberia. Of course, the next major incident was the Expulsion in 1492, which sent hundreds of thousands of Jews to many countries. Judy and I knew what we were going to find, but it was exciting to see it proven and not just something we believed in our minds. It’s not for nothing that our people are called the “wandering Jews” – we went everywhere in the known world and to the barely-known frontiers of the New World. We also know that people who believe they are and have always been Yiddish-speaking Ashkenazim may be shocked to see Sephardic evidence, such as another friend, Harold Rhode of Maryland. Harold was surprised that he was not a “pure Litvak” or from a Lithuanian shtetl. When and how Rhode’s ancestor migrated to Sicily or from Sicily to Lithuania is unknown, though he says it most likely sometime in the 14th or 15th century. As far as Jewish migration goes, In 1492, many Jews left Iberia for Sicily, so many in fact that in 1493, Sicily was considered the largest Jewish community. They thought they would be safe there, but were again expelled in 1493. Many simply went across the Straits of Messina into Calabria, southern Italy, but others went farther afield. Once time travel becomes the next best tool for genealogical research, Harold (and all of us) will be able to research our Sephardic roots more thoroughly. We keep hoping! The project requires more samples and data are needed, and all of us encourage Ashkenazi males with indicators of Sephardi ancestry to have Y-DNA tests with the project to see if they match with known Sephardim or conversos. I always tell people that they have to be prepared for what they will find. Be prepared for the unusual as your ancestry may not be exactly what you think. The results of this small project have far-ranging implications, including genetic testing. The majority of participants in US genetic studies for Jewish conditions are self-identified Ashkenazi Jews (or so they think) as Ashkenazim are the majority Jewish group and identified Sephardim are a tiny minority. If the results of this project can be demonstrated with even larger numbers, it may indicate that many Ashkenazim are really Sephardim. Thus, studies that indicate a possible Ashkenazi gene for this or that condition are misnomers, such as the “Ashkenazi” breast cancer gene (which is also found in Hispanic communities descended from Conversos), and the “Ashkenazi” Parkinson’s gene (announced in 2006 after a Yeshiva University study, and which was later discovered to be merely Jewish after Sephardic communities were tested). To join the IberianAshkenaz project, contact Judy Simon. Just what we needed this week. Al Qaeda spokesman Adam Gadahn revealed his grandfather was Jewish. It’s not that unusual, however, and Tracing the Tribe remembers the revelations of John Kerry and Madelaine Albright and the rumors about Cuba’s Castro and Spain’s Franco. While hidden Jews are fascinating people in all parts of the world, we’ve had a tool since 2000 to help sort out who’s who. That tool is DNA testing used for genetic genealogy. This Daily Beast article, “The Hidden Jews” by Rachel Lehmann-Haupt reveals some case studies on people finding previously unknown Jewish roots. It asks if DNA discoveries will encourage hidden genetic Jews to return or convert to the normative fold, or at least encourage strong affiliation. The author discusses Frank Tamburello, a former Catholic priest – now an ordained rabbi – who discovered his Sicilian Jewish roots. People in the field refer to this “feeling” as a genetic memory, and those of us interested in this subject hear about people feeling this connection for their entire lives until they make an effort to do something about it. The DNA testing for these cases has been conducted by FamilyTreeDNA.com (Houston, Texas), founded by our good friend Bennett Greenspan. A case I’ve known about for years is that of a Polish-origin lawyer in Ottawa, Canada, whose mother was handed to his grandparents by a Jewish couple before they were transported to their death from their Polish town. Cezary Fudali, 41, always liked books about Israel and Middle Eastern architecture. Not until he looked at his own family history did he see a connection. Through an Internet ancestry site, he met a cousin from New Jersey who asked him if he knew his mother was adopted. Fudali was shocked. She told him that in the summer of 1943, during World War II, his maternal grandparents passed through a train station in Rozwadow, Poland, where they met a poor woman who begged them to take her child. Miraculously, his grandparents took the baby home and raised her as their own. His mother, who still lives in Poland, never knew she was adopted until her son heard this story, and his great aunt confirmed it. His mother still doesn’t believe the story is true. In 2003, his research led him to FamilyTreeDNA, the very first company in the field estabilshed specifically for genetic genealogy testing of Y-DNA (male) and mtDNA (female). Since his mother was the connecting point, he was tested for mtDNA (female DNA passed down unchanged from mother to daughter and carried by women and by men). The haplogroup is one found only among Eastern European, Moroccan, Algerian and Turkish Jews. He then concluded his mother had Jewish roots. Since learning about his DNA, Fudali has been working with the U.S. Holocaust Museum trying to locate other relatives. A few months ago, a son of an Orthodox rabbi responded to his request saying she was from Rozwadow area of Poland, and that his aunt had been given up as a baby in 1943. While the story matched, the DNA tests didn’t. He is still hoping to find maternal relatives, and while he isn’t converting to Judaism, he says this information has changed his identity. Now every time he goes to the library to read about the Middle East, he wonders whether his attraction to the subject is in fact a lingering remnant of a spiritual commitment long-passed. In 2006, a group of scientists, including Dr. Doron Behar of Haifa, Israel, found that 40% of Ashkenazi Jews could be traced to four women. In 2008, a team of British and Spanish geneticists discovered that 20% of Spanish men had Sephardic Jewish ancestry, providing more evidence of the large mass forced coversion of Jews during the Inquisition. Following 1492, many expelled Jews went to Sicily. When they were forced to leave again, some converted and stayed, while others also left for mainland Italy, to Calabria in Southern Italy. As Tracing the Tribe has previously noted, Sicily had a large medieval Jewish population. Following the 1492 expulsion of Jews from Spain, many of them came to Sicily. Unfortunately, the Jewish community was expelled from the island in 1493. Many left for mainland Italy, across the Straits of Messina, while others went underground. Jewish settlements existed on Sicily since Roman times. According to some sources, the largest number were brought back by Pompey after he destroyed Jerusalem in 63BCE. Roman Proconsl Crassus was said to have sold 30,000 Jews as slaves. By the Inquisition, there were Jewish quarters (giudecca) in 50 Sicilian cities and towns, as well as some islands off Sicily, with populations ranging from about 350-5,000 individuals. Sicilian Jews lived there for more than 1,500 years and were active in all areas. They were prominent in trading, agriculture, medicine, philosophy, silk, as well as farming and manual trades. Francesco Giunta and Laura Sciascia published a paper in Italia Judaica that includes transcriptions of 349 notary record fragments from the Sicilian Provincial State Archives concerning forced sales of properties following the Expulsion order, and listing Jewish sellers and Christian buyers back to 1492. Their paper contains transcriptions of all the records, in the original Latin, as well as an alphabetic list of the sellers followed by a listing of the buyers and then details of each transaction. Here is the list from that source. X in both Sicilian and Catalan is pronounced as SH. The family name is in upper case with given names (if more than one individual) in parentheses. Abadara Iesu, Abrac Aurifici Paxi, Adili David, Allegrottu Simone, Alluxi Sabet, Aluxu Salomone, Anaf Aron, Arnac Salamone, Asunsi Vita, Attuni/Actuni (Bestet, Busacca, Manuel, Samuel, Azarono), Aurifice/Laurifice (Busacca, Isacco, Leone, Sadia, Abram), Azarini (David, Iuda), Azeni (Aron, Bracon, Geremia, Manna, Mosè, Nissim, Pietropaolo, Sadia), Ben Iosep (Iacob, Leone, Salomon), Benassai Benedetto, Bina Mardoc, Bonet Iosep, Bonu Busacca, Calabrisi (David, Nissim, Salomon), Canet (Crixi, Donato), Catalano Nissim, Chicheri Gaudio, Chippet Xibita, Chispi Abram, Chispu Manuele, Cuino(Abram, Bonavogla, Geremia, Muxa, Rafael, Salomone, Senia), Dat Iuda, Elevi Muxa, Faudali Mardoc, Ficart Busacac, Finei Tobia, Fineni (Manuele, Ricco, Manuli), Fisico Beniamino, Furnari Iosep, Gazi Grazia, Gibet Xibita, Girachio (Gabriele, Salomone), Girgenti Sadia, Guillelmo Mussuto, Guini Savita, Insize Xibita, Isac (David, Muxa, Simone, Xibita), Iuzufi Vita, La Bonavogla Prospero, Laurifice (Aurifice) – see Aurifice, Levi (Busacca, Lia), Lincio (Gabriele, Iacob), Linzio Sadia, Lisia Xibita, Lu Medicu (Abram, David, Salomone, Samuele), Lu Presti (Busacca, Iacob, Scibita), Lumedicu Sadono, Lupu Zactarono, Marsili Sabet, Matrimora (David, Muxa), Millac (Muxa, Sabet), Mira Muxa, Mugnay Graziano, Muxa Maxalufo, Muxarella Gandio, Nagira Nissim, Nalini Aron, Nanu Xibita, Polizzi Anna (Xanna), Rabiki Muxa, Raskisi (Falichisi) Iuda, Rausa Grazia, Russo (Attono, Salomone), Sabuti Iesus, Sacerdotu (Aron, Barono, Busacca, Gabriele, Leono, Lia, Mardoc, Salomon), Salamon Abram, Samuel Xue, Sanzato Gentile, Simonis Muxa, Siracusa Abram, Stozu Iosep, Sufi (Leone. Nissim), Susan Salomone, Tagul (Asaraz, Mardoc), Tolu Iosep, Veri (Manuele, Perna), Vigivani (Muxa, Gabriel), Visa Abrac, Vita Manuel, Xaccaruni David, Xafini Abram, Xamuel Rabin, Xane, Xareri Mardoc, Xattarini David, Xifuni Abram, Xunina (David, Muxa, Iacob, Zibita), Zel Abram. There is another listing of Jewish surnames and given names used in Messina, Sicily prior to 1492. Although this list has been previously posted on Tracing the Tribe, it may be interesting to compare both in one place. This is from Professor Giuseppe Martino’s paper on The Jews of Messina, which is a fascinating Jewish history. Surnames are bolded below. Mubaschir, Surur, Shamwal, Moshe), Bonanno, Bonavoglia (Heftz) ( David, Mosè (Mohe), Bonfiglio, Brigandi, Bruno, Burrada, Campagna, Catalano Mose, Chanchio Sacerdote, Chaninello Muxa, Compagna (Aron, Muxa), Conti (Jacob, Rosa), Costantino, da Bertinoro Obadià, di Dioniso Giosuè, di Minisci (Salomone, Azaria), Fermo Elias, Finzi Gaudio, Gini (Salomone, Guglielmo), Hadad Rabbi Nathan ben Sa ‘adiah, Hasdaj Mosè, Lagumina G, Marino, Marmici Elia, Mazza, Medici Mosè, Monomato (Giovanni, Pagana), Romano, Sanguinetti Rav Ismaele, Scivinell Isacco, Sigilmasi Rabbi Sa ‘adiah, ben Izahaq, Sigtune, Spangnolo (Abramo, Iacopo, Mosè), Staiti, Syminto, Tudela Benjamin, Tzarfati Rabbi Natronay, Zacco (Giuseppe, Gaudio) . EyeItalia is not a site for Jewish genealogy. In fact, it is a site for beautifully created items from Italy, such as linens, bedspreads, notepaper, leather journals and much more. I didn’t expect to find Jewish anything on the site, but was surprised with this great story on the ancient mikveh of Siracusa. The waves of cultures that have bathed Sicily over the centuries have left their traces in the cuisine, language and architecture. The Jews are all but invisible. The island was a virtual melting pot of cultures and an important center of Mediterranean commerce. Because of this prosperity, Jewish merchants were likely here very early in the islands history. Around the year A.D. 63, thousands of Jews, were brought as slaves by Roman armies returning victorious from the Holy Land. Over the centuries, “Giudecca,” or Jewish quarters, varying in size from 350 to 5,000 people developed in 50 Sicilian cities. By the 1300’s many towns were dominated by Jews. Siracusa, in particular had an affluent Jewish community. Records show that many Jews owned luxurious homes. Their professions ranged from doctors and cloth merchants to goldsmiths and tradesmen. In the mid-15th century Sicily’s Jewish community totaled one quarter of the population. Soon however, the heavy hand of the Spanish Inquisition descended on the Sicilian Jews who dispersed to other parts of the world or converted to Catholicism. Until recently the only remaining evidence of this once thriving culture were the repetitive street names in the Giudecca. Now Jewish history comes alive again with the uncovering of the ancient “miqwe” baths. The article goes on to explain what a mikveh is used for and technical matters of where the water originates. How was the ritual bath discovered? In the 1980’s a Sicilian noble woman, the Marquis or “Marchesa” Amalia Daniele, purchased a crumbling palazzo in the old historical center to convert into a “residence” hotel. During the extensive restoration, an odd pattern in the pavement bricks of a courtyard indicated a walled-over threshold. One torn-down wall and five truckloads of rubble later, a stone staircase was revealed that descended 30 feet underground. The next challenge was to drain the enormous amount of water that pooled in the chamber below. As Sicily is an island, nothing is far from the sea however the most obvious “saltwater theory” proved false. This was fresh water that undoubtedly came from the same source as the Fountain of Aretusa; the nearby sacred Greek fountain. Once the water was removed, the structure beneath was revealed: a square chamber with a vaulted ceiling supported by four pillars carved completely out of bedrock. Three water-filled baths were located in the floor of the main chamber and off to adjacent sides were two very unusual, smaller private chambers, each with a bath. All the baths are connected by a common source of water, as required by Jewish law. The privacy provided by the smaller rooms was certainly only for those who could afford it. The size and wealth of Siracusa’s Jewish community may explain why this miqwe is unusually elaborate in its dimensions. The Marchesa researched old records indicating that the Jewish Bianchi family were the original owners of the palazzo. The baths’ construction is believed to be 6th century Byzantine, predating the palazzo by hundreds of years. The Jews were expelled from Sicily in 1493 – a year after the Spanish Expulsion. There are theories that the departing Jews (many also went underground as secret Jews and stayed) filled in the mikveh with rubble before sealing the entryway. While the neighborhood’s destroyed synagogue was remembered, the mikveh was forgotten. Guided tours (in English) of the mikveh are on the hour, 11am-7pm, Monday through Saturday and on Sunday at 11am and noon. Reservations are necessary for groups of five or more. For more information, contact the Residenza alla Giudecca at: allagiudecca@hotmail.com.